I have spent my career serving Philadelphia, and I want to take all that I’ve learned and done to City Council for the benefit of the 3rd District. Jamie grew up here in West Philly. It's where she's raising her two sons. It's where her parents instilled in her the importance of education and working with others to build a strong community. It's where she learned how important it is to stand up for those too often pushed aside. After graduating from Central High School, Jamie received her undergraduate degree in Accounting from Temple University and her Masters in Urban Planning from the University of Pennsylvania. As a mom and as one of the few black female urban planning students at Penn, Jamie knew to succeed, being just as good wouldn't cut it—she had to be better. So, while others talked, Jamie went to work. Jamie joined a program called INROADS, which helped students of color earn internships that would lead to good-paying jobs. Jamie later founded Mommy Grads, an organization dedicated to helping single moms handle the struggles of raising children while attending college. The organization provided mentorships and stipends to ensure women graduated and succeeded. Jamie served at Philadelphia Local Initiatives Support Corporation (LISC), where she helped create good-paying jobs for Philadelphians. Jamie is particularly proud of her work to support bringing the West Philly-based Center for Culinary Enterprises to life, a commercial kitchen that provides local food vendors with safe, clean kitchen space. Jamie also served as the Executive Director of the Sustainable Business Network of Greater Philadelphia, where she helped local businesses become more environmentally sustainable and secure city contracts. As the Executive Director of the Fairmount Park Conservancy, Jamie worked with over 100 volunteer park friends groups to steward and care for neighborhood parks across the city. She also led the Conservancy in carrying out improvements in West Fairmount Park. Jamie knows we must give our children safe places to grow and play. West Philly shaped Jamie's life, and inspired her to dedicate her career fighting for fairness, equality, and justice. 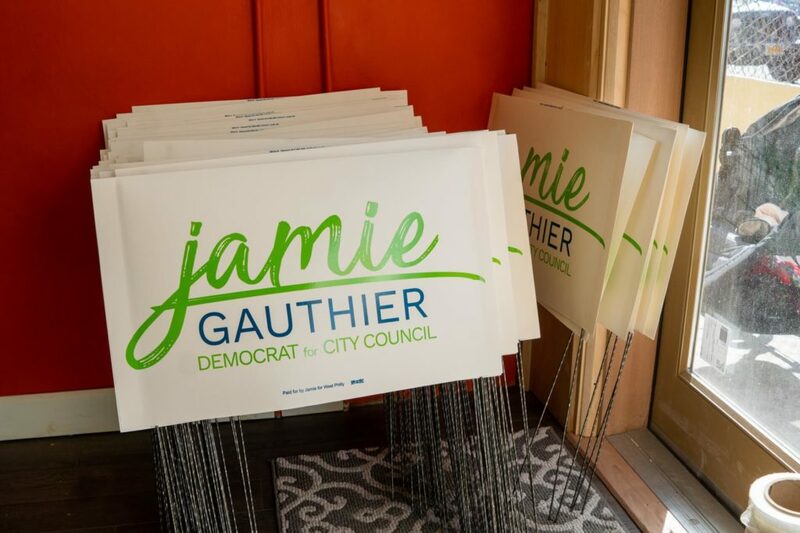 From helping single moms get through college, to helping organizations create good-paying jobs, to creating more green space in Philly, Jamie Gauthier has the experience, the fresh ideas, and the drive to deliver for our communities. We need Jamie in City Council. Stand with Jamie and together, let’s work to make housing affordable, help local businesses create good-paying jobs, improve our schools, and advance a more sustainable agenda for the 3rd District.